Appearing at the awards ceremony were, from left, Leslie Cordes, branch chief of the EPA Energy Supply and Industry Branch; Matthew St. Clair, sustainability manager from the UC Office of the President; Marcia Winslade, UCSC Sustainability Assessment Project manager; and Blaine Collison, program director of the EPA Green Power Partnership. SANTA CRUZ, CA-UC Santa Cruz has been honored by the U.S. Environmental Protection Agency as the Individual Conference Champion for purchasing more green power than any other school in the Association of Division III Independents Conference. The EPA tracked green power purchasing among collegiate athletic conferences through its College & University Green Power Challenge, which concluded recently with 33 schools and 16 conferences participating nationwide. EPA's Green Power Partnership encourages organizations to purchase green power as a way to reduce the environmental impacts associated with conventional electricity use. 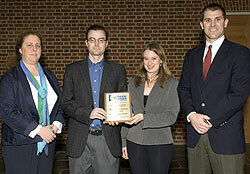 The 2006-07 honor is the second for the campus this year from the EPA. In January, the EPA named UC Santa Cruz its sixth largest green power purchaser in the country. The list was based on purchases through Dec. 31. Marcia Winslade, UCSC Sustainability Assessment Project manager, accepted the award for UC Santa Cruz on April 18 at the Second Annual Campus Sustainability Conference in College Park, Maryland.